Our last few days in Japan were spent in the small hot spring town of Shibu Onsen up in the Japanese Alps. On the way there from Osaka we split the journey up with a few hours in Matsumoto to visit its castle and grab some lunch. The castle was spectacular and well worth visiting but unfortunately the restaurant I really wanted to eat in wasn't open so we settled for some fried chicken and a beer near the train station before continuing our journey north. Matsumoto castle is Japan's oldest original wooden castle. You can take a tour inside too. Shibu Onsen is famous for its nine hot spring baths that are only available to town residents and guests of the town's traditional Japanese inns via a special key, but there is also a famous snow monkey park where the primates enjoy their own hot spring fed bath only a few miles away from the town. In the morning after our first night in our inn its owner drove us up to the start of the path leading up the valley to the park. Despite there being signs at the visitor center advising that seeing the monkeys wasn't guaranteed they were out in force, no doubt due partly to the fact that the park staff feed them daily. Snow monkeys relaxing around their own onsen. After taking a forest walk back to Shibu Onsen we visited a sake museum and then decided to have some lunch before soaking in some of the town's hot springs. Soon sat on the floor of a cosy small restaurant I quickly spotted something on the menu that was a little bit unusual. Basashi is raw horsemeat and it was the dish I had been hoping to try in Matsumoto so I was pleased to see it on the menu and ordered myself some. I've never tried cooked horse meat before so trying it raw was a bit adventurous perhaps. It's served thinly sliced and is accompanied simply with some freshly grated ginger. It was incredible good and I'd highly recommend it. The day before we flew home we made our way back to Tokyo on the bullet train and then caught a local train to Narita where one of Tokyo's two airports is located. Arriving at our hotel Lillian wanted a nap so I jumped on a local train and headed just out of town to have one last attempt at catching some tanago in a drainage canal next to Lake Inbu-numa. I caught a few fish, mostly small bluegills, but sadly I failed to catch any tanago. I did add two new species to my trip tally before light started to fade and I headed back to Narita. .. and a few field gudgeon. With an early flight to catch in the morning we went out in the evening for one last meal in Japan. We decided to try an all you can eat buffet and enjoyed unlimited gyoza, noodles, chicken curry and fried vegetables at a small restaurant called Spiral Staircase which was close to our hotel. The meal came with a massive glass of Asahi and was a great way to end our trip. If you're in Narita it's well worth a visit and at about £14 including the beer and also pancakes and icecream for dessert it was suberb value too. A nice big ice cold beer. I loved Japan. It was such an amazing trip on so many levels and there were so many things I haven't mentioned in these reports. This is a fishing blog after all. That being said I probably didn't do as much fishing as I would have liked and it was also tough at times but despite that I managed to catch a respectable sixteen species with fifteen of them being new. Here's what I caught. Several of the saltwater species I caught were identified using the following book which I would highly recommend if you plan on fishing in Japan. It was bought and sent to me by someone who lives in Japan so getting a copy isn't straight forward. The title is "Marine fishes of Japan". The book's ISBN is 9784635070256. Well worth the extra effort required to get a copy though. I'd also like to quickly thank Masa for the advice he gave me while I was in Osaka and Adam for putting me in touch with him. Masa has also promised to meet up with me and take me fishing with him when I return and because Lillian and I had such a great time we have already booked our flights and will be heading back in November again. This time we will be exploring the southwesternmost of Japan’s main islands, Kyushu. It goes without saying some fishing tackle will be going to the land of the rising sun again too. Species Hunting fun in Japan : Back in Osaka. On our penultimate day in Osaka we visited its castle in the afternoon and afterwards, under strict supervision, I was allowed to visit an incredible tackle shop that was dedicated to only lure fishing styles. After spending a while browsing I treated myself to a spool of Sunline Small Game braid, a few pieces of end tackle and a rockfishing magazine/DVD managing to spend less than £50 in the process so Lillian did a fantastic job of keeping me under control! The evening before our day trip to Rabbit Island Masa had very generously pointed me in the direction of some marks I could fish for Japanese horse mackerel that were only a couple of metro stops away from our accomodation. In the evening Lillian decided to have a nap after we ate way too much grilled chicken for our dinner so I grabbed my gear, jumped on the Chūō line and headed out on my own for a couple of hours' fishing. Osaka after dark from the top floor window of the Osaka Bay Tower. A huge ferris wheel lit up red marked the spot. I started my session at the same spot near the aquarium where I'd fished a few days earlier but after a while I'd had no bites so I walked to a second spot, one that Masa had recommended. Another angler was there already and I watched him catch the target species as I approached so I started fishing along from him. 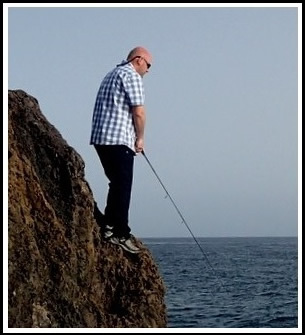 Simply casting out and feeling for takes on the drop I was soon catching a few Japanese horse mackerel as well which I gave to the local angler as he was keeping the ones he was catching. My time was soon up but quite happy to have caught a few of my target species I headed off. I'd bought some new jigheads and soft plastics to use and went with the combo above, an Ecogear Aji Chon jighead and ThirtyFour Octplus lure. The jighead is designed to nose hook the soft plastic but I went with a more standard straight presentation which worked fine. My first Japanese horse mackerel. Prized by Japanese anglers Aji are a popular target because they are both delicious and good fun on the tackle used to catch them. On our last day in Osaka I wanted to try and catch some tanago. After another supervised trip to a tackle shop to replenish my micro fishing supplies, we headed to some large ponds next to the Yodo river in the north of the city. Again Masa had given me the location and had told me it was a famous spot amongst Osaka tanago anglers. Another serious looking sign greeted us upon our arrival that this time had photos of tanago on it. I was sure Masa wouldn't send my to fish somewhere that tanago fishing wasn't allowed so I just set about finding a likely looking spot to fish. There are several different species of tanago in Japan. Masa would later tell me the one on this sign is very rare and protected. Setting up my rod the wind began to pick up and when I got started this made it very difficult to fish with such incredibly light tackle. Eventually I found some slightly more sheltered spots and started getting some tentative bites. My tiny float would just dip slightly though and I struggled to connect with them. The gluten bait I was using didn't seem to stay on the hook very long either so I switched to a tiny piece of cooked rice. Finally my perseverance paid off when I got a much more positive bite, my tiny float went straight under and I lifted into a tiny fish. Swinging it quickly to hand I was excited for a brief moment before I realised that it wasn't a tanago and was in fact a tiny bluegill. By this point we were both pretty cold so I reluctantly admitted defeat and we headed off to get some piping hot Takoyaki in a nearby restaurant before catching a bus back into the city. The following day we were getting up early to take a train up north into the mountains to spend a couple of days relaxing at a traditional Japanese ryokan in the hot spring town of Shibu Onsen. I wasn't sure if I'd get any opportunities to fish but I was really looking forward to this relaxing part of the trip even if the end of our adventure was fast approaching. Species hunting fun in Japan : Okunoshima. Two days before we left Osaka we decided to have a day trip and one where I could do a fair amount of fishing. After three hours plus spent riding the shinkansen, local trains and a bus, we arrived in the small town of Tadanoumi where we waited to take a short ferry crossing to the small island of Okunoshima, also known as Rabbit Island. While we waited for the ferry to make the last leg of the journey I had a quick fish in Tadanoumi's harbour. There were some shoals of damselfish swimming around and I quickly caught a few on tiny sections from the tail of a Gulp fish fry. Tying on a larger hook, putting on piece of angleworm and trying my luck further out into the harbour rewarded me with a couple of small red seabream. I'd later identify this damselfish as a pearl spot chromis. In the water they have white spot on their back at the back end of their dorsal fin that appears dull brown when they are out of the water. Red seabream are very similar to their European cousin the Couch's seabream. The ferry soon arrived so I packed up and we got onboard. The sailing only took about fifteen minutes and we were soon on Rabbit Island. Okunoshima is known as Rabbit Island because, as you've perhaps already guessed, it's home to lots of rabbits. They're tame rabbits so expecting a friendly furry welcome upon our arrival we had bought a few bags of rabbit food at the ferry ticket centre in anticipation. Rustling this bag was like ringing a dinner bell. Any rabbits within earshot would run towards you. Before fishing I couldn't resist feeding a few treats to the adorable little swines. I soon got down to business while Lillian was mobbed by ever increasing numbers of her new friends. She managed to escape from the bunnies briefly to take a photo of me though. This first spot was a fairly shallow rocky area and I caught lots of wrasse on angleworm fishing it on a dropshot rig. Some research was required when we got home to identify the colourful fish. My first wrasse of the trip was this Bleeker's wrasse. This one is a multicolorfin rainbowfish. Like the Bleeker's wrasse it was very similar in shape to the Mediterranean rainbow wrasse. This is also a multicolorfin rainbowfish. The first one is a female and this larger specimen is a male. We spent the afternoon walking around the island admiring the scenery and stopping to rustle our bag of pellets and feed the rabbits as we went. Not everything on the island is cute and fluffy however. The island also has a dark past. In the years before and during World War II a poison gas production and storage facility was secretly in operation on Okunoshima. After the war ended, when the Allied forces discovered the operation, the manufacturing equipment and stockpiled gas were all destroyed. Many of the buildings remain however, no in ruins they serve as a reminder of what the island had been used for. One of several derelict buildings on the island. Poison gas production relics aside, the island was quite a beautiful place and as we worked our way around its coastline I found a spot where the water was a lot deeper within casting distance. This sea bed in this area was also rocky and as well as lots more wrasse it also produced a couple of rockfish one of which was my third rockfish species of the trip, a marbled rockfish. A beautiful spot with lots of other islands in the distance and the sun bursting through the clouds from time to time. This is a marbled rockfish or kasago in Japanese. The other was my second darkbanded rockfish of the trip. Whilst multicolorfin rainbowfish made up the bulk of the wrasse I caught I also caught a solitary star bambooleaf wrasse. What a great name I thought when I identified it back in our Osaka apartment. The star bambooleaf wrasse was bit more chunky and put a good bend in my Rock Rover. Before we knew it we had walked almost all the way around the island and were getting close to the ferry pier so I briefly fished at one final spot. The bottom there was clean sand and this produced a few Japanese whiting and a couple of red seabream. With the fairly long return journey to make I packed up and we headed off to the pier so we could head back to Osaka. Okunoshima might be known as rabbit island but as I had discovered it's quite a fishy island too. I'm just a guy who loves fishing, enjoys catching lots of different species using a wide variety of methods and will happily give anything a try. I've spent the last few year species hunting all over the U.K. and also abroad in the Mediterranean and Eastern Atlantic. Working long hours in a tackle shop ironically means I have less opportunities to fish unfortunately. Like last year I'll be trying to make the most of any chances I get to fish and won't be setting myself any targets. This blog is a diary of what I get up to and I hope you enjoy reading it. I owe a great debt to the many other anglers who have helped me to catch a lot of fish and whilst I'm certainly no expert I'm happy to share what I've learned along the way. I've got a few good friends who sometimes go fishing with me and it's always great to meet up with fellow anglers too so if you want to talk about something fishy or maybe even meet up and try and catch something fishy feel free to get in touch with me. Species I caught in 2018. Every angler blanks. We rarely talk about it though. When the goal is catching fish it's never nice to fail but regardless to most of us it's still a pleasure to be out fishing even when we're not catching. For the record I've not blanked yet this year.